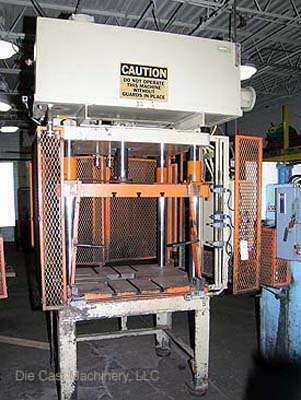 For Sale: One - Used - Second Hand - MultiPress 35 Ton Four Post Vertical Trim Press DCM 1807. Inventory item: DCM-1807. One used (second hand) Metal Mechanics, Model: 35, 35 Ton 4 Post Hydraulic Die Cast Trimming Press, Serial Number:, New in: 1993, equipped with 37-1/4" left to right x 27-1/4" front to back tie bar clearances, 49" left to right by 39" front to back bed size, three (3) side core punches, 32" daylight, 23" stroke, 9" shut height, Allen Bradley SLC 500 solid state controls. DCM Inventory Number: 1807. This item is part of the Lunt Manufacturing Company liquidation. It may be viewed at the Lunt, Schaumburg facility located at 601 Lunt Avenue, Schaumburg, IL 60193. To view all of the available items at Lunt Manufacturing, please click on View Machinery and then click on Lunt Manufacturing. To schedule an appointment to inspect this machine or other items at Lunt, please call our office at 847- 360-9170. This item is part of the Lunt Manufacturing Company liquidation. It may be viewed at the Lunt, Schaumburg facility located at 601 Lunt Avenue, Schaumburg, IL 60193. To view all of the available items at Lunt Manufacturing, please click on View Machinery and then click on Lunt Manufacturing. To schedule an appointment to inspect this machine or other items at Lunt, please call our office at 847- 360-9170.